Dusk was giving way to a cool spring Jazz Fest night at the Music Box Village, an outdoor hamlet of musical shanties and sound-making structures by New Orleans’ Industrial Canal, when Mike Dillon of Nolatet delivered a solo-ending “thwap” to his vibes. He paused and smiled, his mallets uncharacteristically still for more than a few bars while bassist James Singleton and drummer Johnny Vidacovich dug into the tune. When pianist Brian Haas picked up a melodica, looking cautious as he waited for the right moment to dive in, Dillon selected a piece from his handheld percussion arsenal and set up a restrained layer of sound beneath the building drum solo. 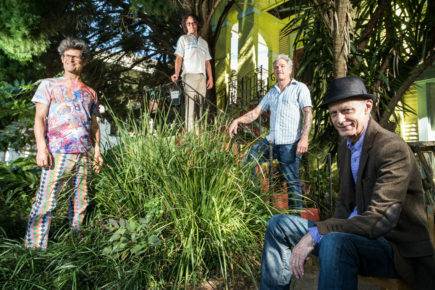 The band is nestled in a corner of Singleton’s greenery-ensconced porch overlooking Bayou St. John, rehashing the weekend’s performances, their first shows together in five months and the first dates on their spring tour. 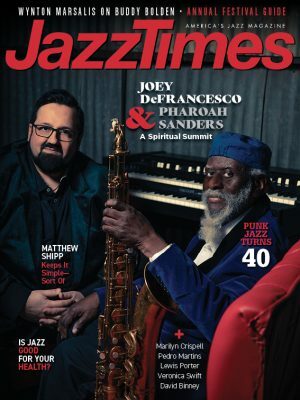 Though the word “effortless” comes up repeatedly in relation to what it was like playing the material again, there’s some chatter about a moment when Dillon jumped the gun transitioning from one tune to the next. Singleton points out the importance of giving space to the audience as well as to each other, an idea he apparently conveyed to Dillon the night of the show. Space, patience, and a willingness to, as Dillon puts it, “remain teachable,” are central to what makes Nolatet tick. Combined, those elements create an energy balance within the music that’s evident in moments like Dillon’s extended pause near the end of the Music Box Village set. It’s also evident on their latest release, No Revenge Necessary, a seesawing and percussive mix of quirky melodies, classically informed harmonies, gentle grooves, and short bursts of punk-rock moxie. As in the band’s live shows, musical narratives shift in unexpected ways, with the whole group contributing to a sense of cohesion on each tune. There’s a bigger and more complex sound at work on the new album than on Nolatet’s 2016 debut Dogs, thanks largely to the addition of marimba, tabla, pocket trumpet, melodica, and bass melodica, as well as timpani, which Vidacovich plays beautifully, adding a melodic richness to the rhythm material. With expanded instrumentation, each player has more voices and ideas to work with, while the space built into tunes like Singleton’s “Black Sheep” gives resonance to every detail, from the soft splay of drum rolls beneath his gently funky bassline to the tabla that warms up Haas’ rubato finish. Haas, who wrote five of the album’s 10 tracks, delivers a softer performance on the new album, too. He jokes that his hands “looked like sausages” the day of the session because of an overzealous stride piano situation the night before. The swelling forced a different approach, though, setting up a new layer of contrast against Dillon’s more exuberant energy. Nolatet grew out of a 2014 Telluride Jazz Festival appearance by Dillon, Vidacovich, and Singleton’s DVS trio that Haas (leader of the Jacob Fred Jazz Odyssey for nearly 25 years) joined as a guest. Later, Haas traveled from his home in Santa Fe, N.M., to sit in on a handful of dates with the group in New Orleans. Things were clicking as a quartet and Haas suggested they record, which yielded Dogs. A tour followed, during which time Nolatet’s improvisations got more adventurous and Dillon and Haas—both younger than longtime Astral Project colleagues Singleton and Vidacovich—found themselves playing with more patience. They then headed back to the studio to capture their expanding sound with No Revenge Necessary. When Haas points out the band is a “vehicle for experimentation,” Vidacovich chimes in again. “That’s what the band is really designed to do,” he says, his voice cracking through a native New Orleanian lilt. “I imagine a bunch of little kids jumping up and down on the ground in a circle in the dirt and makin’ a whole mess and then up above ’em is this big, beautiful cloud of dust, which is much larger than the kids playin’.” The gesticulations that come with Vidacovich’s metaphor send Dillon, Haas, and Singleton into fits of laughter. “It’s bigger than any of us could make alone,” he adds. The band’s giggles subside as they agree he’s right. Read JazzTimes‘ review of Nolatet’s 2016 debut album, Dogs.